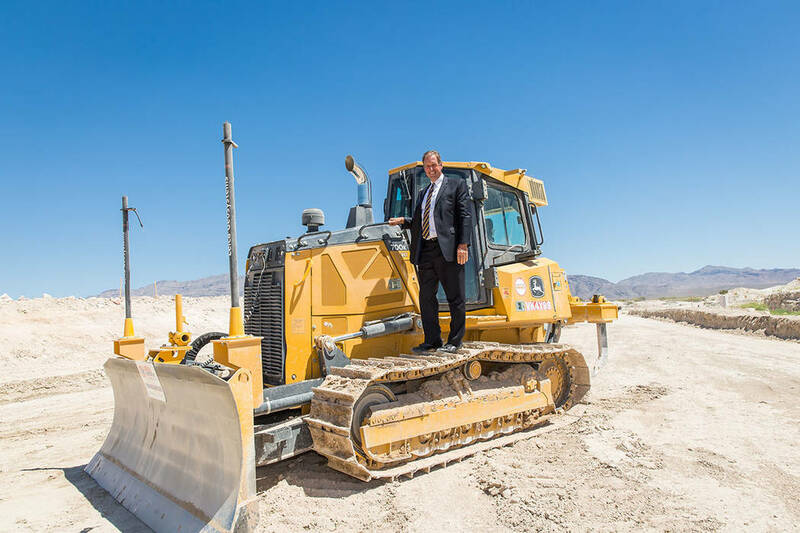 Groundbreaking ceremonies were held May 27 for The Villages at Tule Springs where 1,280-acres on the north end of the valley are developable for a maximum of 8,683 homes. The project was previously known as Park Highlands, part of planned development led by Southern Highlands developer, the Olympia Group, that with homebuilder partners acquired 2,675 acres in 2005 for $639 million as part of a federal auction. California-based KBS Capital Advisors, along with its partners were the successful bidder in a federal bankruptcy auction in December 2011, acquiring 1,375 acres. Two years later, it acquired another 295 acres to bring its total to 1,670 acres. The initial phase of 160 acres south of the 215 Beltway near the Revere Street exit is expected to have more than 1,000 homes and include a 35-acre regional park and police station. It’s a project led byPardee Homes as the point developer of what’s called Village Three. They are joined by KB Home and CalAtlantic Homes. Builders haven’t finalized prices, but some suggested they will be in the low $200,000s on the low end and $400,000s on the high end. That’s welcome news for buyers since the median price of new single-family homes closed in May was nearly $345,000, according to Las Vegas-based Home Builders Research President Dennis Smith. Given what land costs, similarly built homes in Summerlin and other parts of the valley would cost 50 percent more in some cases, he said. Since January the new home median price has risen by $13,377, and year-to- year it has increased by $18,265, or 5.6 percent, Smith said. The reason is construction material and labor costs continue to go up, he said. Aliante in 2003 was the last major master-planned community to open in North Las Vegas. Eldorado, which is south of Tule Springs, opened in the late 1980s. 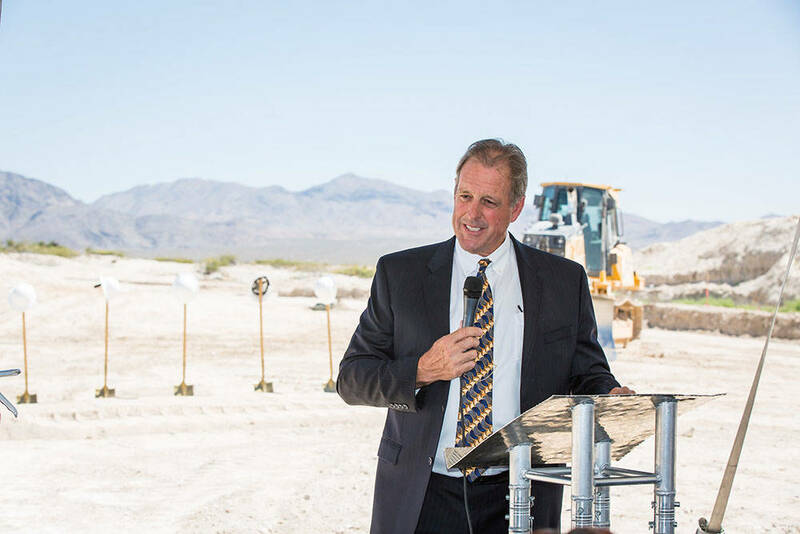 Smith said The Villages at Tule Springs has “everything going for it” given its location near the 215 Beltway, the potential for job growth at Apex industrial park in North Las Vegas and nearby Nellis and Creech air force bases. North Las Vegas Major John Lee said the project will be a big part of the city’s future success. Many people who’ve worked in North Las Vegas lived in Summerlin and Green Valley in Henderson. “We have never had a Green Valley-type of effect here where you can live in Henderson and work in Henderson right here in North Las Vegas,” Lee said. Having another master plan will be an impetus for prospective employers to relocate to North Las Vegas because it will provide housing for employees, Lee said. The city has its niche, Lee said. “The Strip will be Clark County, and Fremont Street will be Las Vegas, but North Las Vegas will be the breadbasket of this whole region in terms of diversification (with non-gaming and manufacturing jobs),” Lee said. Lee said he even envisions the development as being a place executives would want to build a high-end home to be closer to their company’s operations. The highest-price home sold in North Las Vegas since the recession is about $400,000, Lee said. None of the builders plan to construct higher-end home at this time. Smith said it’s possible as the community matures, but the lack of a golf course and hillsides makes it more difficult to do so. Pardee Homes brought North Las Vegas its first master-planned community 30 years ago with Eldorado. It acquired 57 acres in Tule Springs for $11.4 million in May, according to Dan Hale, the company’s vice president of community development. Pardee built more than 6,000 homes in Eldorado since the late 1980s and has less than 200 lots remaining, he said. “We felt this was a natural extension for us, and we’re very excited about it,” Hale said. “This is a new chapter for us, and with the connection to the Beltway, we think it will be a big winner for us.” Homes will range from 2,000 to 3,400 square feet and prices range from the high $200,000s to the $400,000s, Hale said. The homes are intended for move-up buyers and families, and about 350 homes are planned with an interest to acquire more land, he said. KB Home has 43 acres for which it paid $8.5 million. Division President Brian Kunec said KB’s focus is affordable homes for first-time buyers. The square footages will range from 1,589 to 3,509 square feet and prices will be in the low $200,000s to low $300,000s, Kunec said. Dana Rogers, division president with CalAtlantic Homes, said it plans to introduce three housing product types for its site that measures less than 60 acres. There will be a duplex, entry-level homes and move-up homes. No prices or sizes have been determined by CalAtlantic, which did not acquire its land from KBS. Building will start in early 2018 and homes completed by the end of the second quarter or beginning of the third quarter, Rogers said. More than 300 homes are planned. The Villages at Tule Spring’s Village One and Village Two are north of the 215 Beltway and border the Eglington Preserve, which is a part of the 22,650-acre Tule Springs Fossil Beds National Monument. Project development plans include trailheads to connect to the monument, according to Brian Ragsdale, executive vice president of KBS Capital Advisors. Village Four is south of the 215 Beltway and east of North Fifth Street adjacent to existing retail and amenities. Village Four consists of about 105 developable acres with plans for nearly 600 homes and two neighborhood parks. Nathan &Associates LLC Land Brokerage Services on behalf of KBS expects to begin marketing Village Four in the third quarter of 2017, Ragsdale said. Smith said the 2017 pace is about 300 percent less than what it tallied through the first five months of 2005. Compared to six years ago, new home closings in May increased by 162 percent, he said. There were 779 new home closings in Clark County in May to bring the yearly total to 3,435, an improvement of 27.7 percent over 2016, Smith said. He added the new home closings during the second half of 2017 should soften but maintain double-digit year-to- year gains.